Yeah, the more I find out the less I know. Somewhat self-serving, but at the end Brad DeLong gets it right! But we – or at least I – have gotten significant components of the last four years wrong. Three things surprised me (and still do). 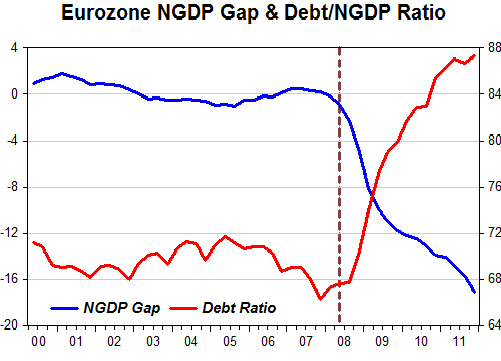 The first is the failure of central banks to adopt a rule like nominal GDP targeting or its equivalent. The failure of central banks to target nominal GDP growth remains incomprehensible to me, and I will not write about it until I think that I have understood the reasons. The possible conclusions are stark. One possibility is that those investing in financial markets expect economic policy to be so dysfunctional that the global economy will remain more or less in its current depressed state for perhaps a decade, or more. Better late than never. If only he (and others) had focused on this last point from the start instead of proselytizing in favor of “self-financing fiscal stimulus” things might have progressed differently. More than four years after the financial crisis began; the world’s major advanced economies remain deeply depressed, in a scene all too reminiscent of the 1930s. And the reason is simple: we are relying on the same ideas that governed policy in the 1930s. These ideas, long since disproved, involve profound errors both about the causes of the crisis, its nature, and the appropriate response. In the face of a less severe shock, monetary policy could take up the slack. But with interest rates close to zero, monetary policy – while it should do all it can – cannot do the whole job. Which commits the common error of associating the stance of monetary policy with the level of interest rates. And to all those hundreds of economists’ monetary policy cannot do much! A sad state of affairs indeed. Those who credit the war with economic recovery in the form of giant government expenditures and rising GNP must also explain the absence of any economic downturn following disarmament. What should have been the “worst cyclical downturn” in U.S. history was barely noticeable. The lack of a second depression in 1946 has drawn further attention to the limits of aggregate economic statistics, especially during war when government action can heavily distort figures (Vedder and Gallaway 1993: 3-5). 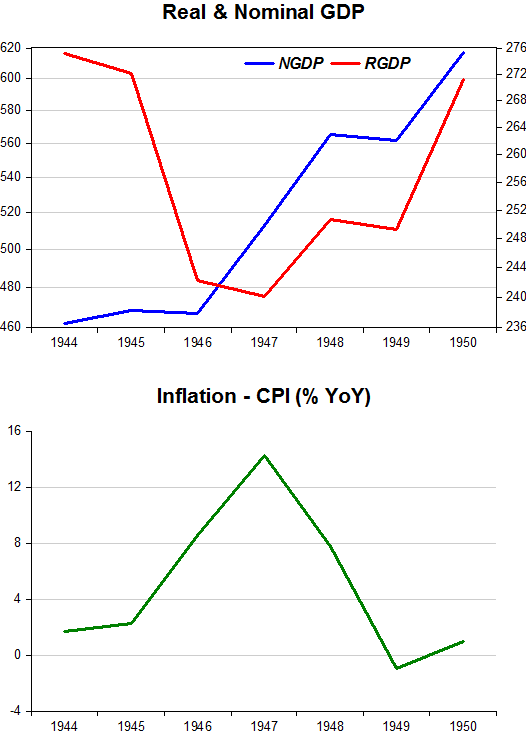 For the same reasons that the calculated GNP did not depict reality in describing what occurred in 1946 as the government reduced spending, we should be skeptical of the validity of the growth rates as government-sponsored production increased between 1940 and 1944. As has been copiously shown, the recovery which began in 1933 was the result of expansionary monetary policy following FDR severing the dollar from gold. And as the chart below indicates, the adjustment following the end of WWII was quick and swift. Why? 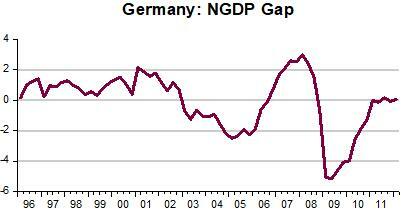 Answer: nominal spending (NGDP) didn´t crash, or even falter, like it did in 2008! Back in October 2011 Bruce Bartlett wrote and talked about NGDP targeting. In a CNBC interview at the time he criticized the Fed for “sitting on its hands” and argued it could spur aggregate demand if it adopted a nominal GDP level target. I have no idea why he switched to talking about inflation expectations and how they have to be raised. 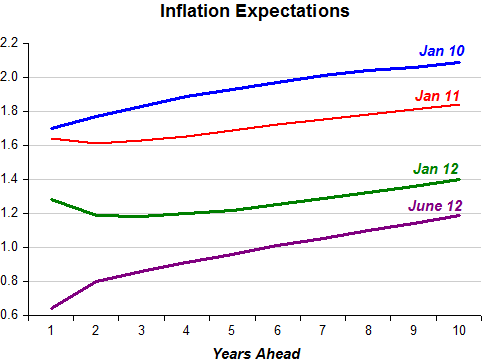 The word inflation is a debate stopper and BB will never be able to assuage people´s fears of future inflation. He should have stuck to NGDP targeting, because that´s exactly what he means. The annual report is a remarkable document, one which might well come to serve as the epitaph for an era of central banking spanning the Volcker disinflation and the Great Recession—the epoch of the central banker as oracle, guru, maestro. If the end of this era is upon us, we can credit a series of revelations: that central bankers learned the lessons of economic history less well than they’d thought, that they displayed an unfortunate tendency to set aside economic rigour in favour of an obsessive focus on price stability, and (perhaps most importantly) that they are in more need of democratic accountability than is often assumed. Above all, the report captures what may be the most critical error of the modern central banker: eschewing a focus on his proper domain—demand stabilisation—in favour of an arena in which he has no business sticking his nose—the economy’s supply side. The irony is that, considering only the Volcker-Greenspan-Bernanke triumvirate, Bernanke was supposed to know the “lessons of economic history” better than any other but ended up showing the most “obsessive focus on price stability”, to the economy´s loss. Many economists in fact credit central bank monetary policy as the key factor in the last decade´s reduction in inflation worldwide. I would like to believe that. I do not deny that we adjusted policy to be consistent with global disinflationary trend as they emerged. But I very much doubt that either policy actions or central bank anti-inflationary credibility played the leading role in the fall of long term interest rates in the past one to two decades. The decline (and the conundrum) can be accounted for by forces other than monetary policy. In fact, during my experience since the mid-1990s with the interaction between the policies of the world´s central banks and the financial markets, I was struck by how relatively easy it was to bring inflation down. The inflationary pressures of which I was so acutely aware in the late 1980s were largely absent or, more accurately, dormant. The “conundrum” exposed this point. And he got nicknamed ‘Maestro’! If you want to “peddle” your country, host an international conference! This is from Ivan Eland, “The U.S. Should Take Lessons from Mexico,” June 20, 2012. More important, the bad publicity on the drug death toll has unnecessarily dispirited even Mexicans and eclipsed Mexico’s economic success story. Brazil, billed as an engine for Latin American economic growth, has also overshadowed the equally middle-income Mexico. Yet in 2011, the relatively open Mexican economy, which has increased competitiveness, outgrew its Brazilian counterpart, dominated by large state-owned industries, 3.9% to 2.7% and is expected to maintain that gap in 2012. Whereas Brazil, like the United States, has debt-burdened consumers, Mexico has had manageable debt, low inflation, 17 years of macroeconomic tranquility, and thus investors in the automobile, aerospace, and electronics sectors banging down the door to get into the country. Mexico’s most-recent annual growth rate (the chart doesn’t make clear, but I think it’s in real terms) is 4.6 percent. Not bad. Mexico’s rating on the Economic Freedom scale? 75th. That accords with my prior views. Which makes its growth rate somewhat surprising. And Brazil is ranked 102ond, which makes any growth even more surprising. But if you look closer, there´s not much growth to be seen over the last 30 years. The charts illustrate. 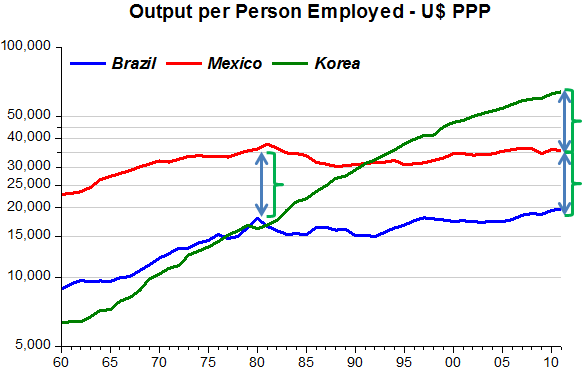 In the first chart, Brazil and Mexico are compared with Korea on the basis of output per employed person. No contest there. 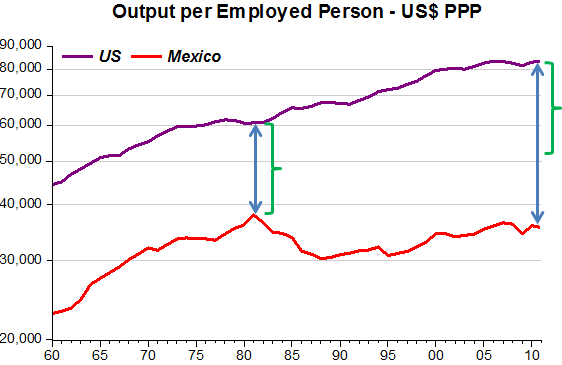 The arrows indicate that in 1980 Mexico´s productivity was higher than Brazil´s, which was about the same as Korea´s. Thirty years on Korea´s productivity is higher than Mexico´s by an amount almost identical to Mexico´s advantage in 1980, while the difference between Mexico and Brazil has remained almost exactly the same, with both having essentially stagnated during that time! The next chart indicates there are not many lessons the US should take from Mexico. It´s exactly the opposite! Like Ron Paul, Joseph Stiglitz also wants to “End the Fed”! The Fed has consistently failed to understand the links between inequality and macroeconomic performance. Before the crisis, the Fed paid too little attention to inequality, focusing more on inflation than on employment. Many of the fashionable models in macroeconomics said that the distribution of income didn’t matter. Fed officials’ belief in unfettered markets restrained them from doing anything about the abuses of the banks. Even a former Fed governor, Ed Gramlich, argued in a forceful 2007 book that something should be done, but nothing was. The Fed refused to use the authority to regulate the mortgage market that Congress gave it in 1994. After the crisis, as the Fed lowered interest rates — in a predictably futile attempt to stimulate investment — it ignored the devastating effect that these rates would have on those Americans who had behaved prudently and invested in short-term government bonds, as well as the macroeconomic effects from their reduced consumption. Fed officials hoped that low interest rates would lead to high stock prices, which would in turn induce rich stock owners to consume more. Today, persistent low interest rates encourage firms that do invest to use capital-intensive technologies, such as replacing low-skilled checkout clerks with machines. In this way, the Fed may still be contributing to a jobless recovery, when we finally do recover. Unsaid, but implied, everything is dependent on fiscal policy. There definitely must be something in the champaign they serve to toast Nobel recipients! The world must be topsy-turvy when the BIS (Central Bank to Central Banks) thinks monetary policy is too expansionary! At the meeting held today, the BIS issued their Annual Report which addresses key monetary policy issues. BIS analyses often contain useful warnings, including their prescient warning in the years around 2003-2005 that monetary policy was too easy, which turned out to be largely correct, as the boom and the subsequent bust made so clear. So the Annual Report is always worth reading. First, the policies “may delay the return to a self-sustaining recovery.” In other words, rather than stimulating recovery as intended, the policies may be delaying recovery. Fourth, the policies “have blurred the line between monetary and fiscal policies” another threat to central bank independence. Just go tell that to the ‘people’ in this image Becky Hargrove and I love so much! For a long time market monetarists have argued that the Fed´s evasive monetary policy is the major force keeping the economy down and out. Keynesians, notably Krugman, argue that the solution requires much more forceful government spending. That´s because, given the extremely low level of interest rates, the economy is in a liquidity trap. That idea follows from a very narrow view of what monetary policy is about (for more on that see this Tim Lee post). It shows a bunch of thirsty people, made so weak that they´re unlikely to make it to the ‘oasis’. 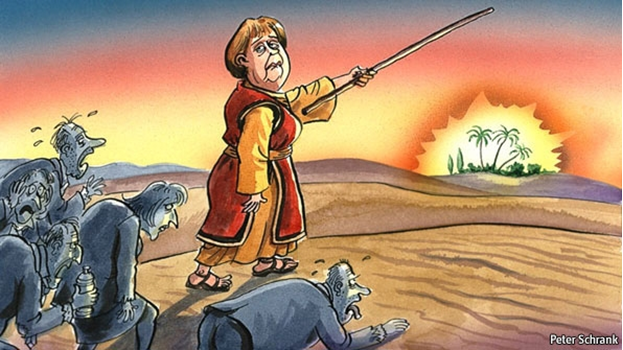 And ‘leader Merkel’ appears indifferent to their suffering, indicating that´s the only way to reach ‘nirvana’. 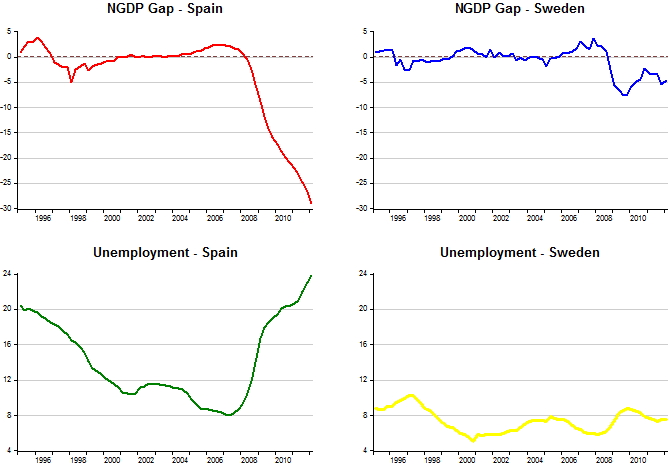 The chart below compares and contrasts two countries, Spain and Sweden. The first is struggling to keep going, despite extreme “thirst”. The other is enjoying the luxury of having plenty of ‘food and water’. One does not enjoy the luxury of having its own ‘reservoir’ from which it can get ‘water’ as needed. The other does. Some months ago David Beckworth showed a version of the picture below, which I think is the most vivid representation of the cyclical monetary problem (that overlays the structural one associated with single currency flawed monetary system that exists independently). This figure shows that ECB’s failure to stabilize and restore nominal spending to expected levels–as proxied by the 1995-2006 trend–during the crisis as the real culprit behind the Eurozone crisis. This failure to act has been devastating because it means nominal incomes are far lower than were expected when borrowers took out loans fixed in nominal terms. European borrowers, both public and private, are therefore not able to pay back their debt and the result is a fiscal crisis. And how come ‘leader Merkel’ appears so ‘strong and healthy’? As the next chart shows, Germany is well ‘watered’, enjoying a spending level close to the trend that prevailed during 1992 – 2005. You shouldn´t ask ‘thirsty’ people to stay away from ‘water’ by way of ‘fiscal austerity’. The solution requires that the ECB ‘placate the thirst’ by restoring nominal spending to a level that allows the most affected countries to ‘get up and walk’! The Fed said in its official statement Wednesday that it was prepared to take additional action if the job market doesn’t improve. Mr. Bernanke repeated that sentiment over and over again at his press conference. Given how he has behaved in the past, one has to believe he really means it. If he develops more conviction that the recovery is under serious threat, bold follow-up action now looks like a real possibility. And if the recovery miraculously improves, he has lost nothing. Not only things have NOT been improving, they have been deteriorating. 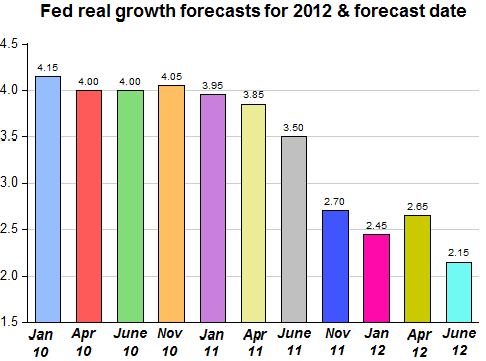 Take a look at the Fed´s real growth forecasts for this year starting in January 2010. Then take a look at a market based measure of short and long run inflation expectations from the Cleveland Fed over the same period. Reminds me of the movie, only here it´s “Honey, I´ve shrunk growth and inflation expectations”!